Birthplace : El Paso, Texas, U.S.
Eugene Wesley Roddenberry (better known as Gene Roddenberry), creator of the television series Star Trek, saw space as a place for learning new ideas and ways of thinking. Born in El Paso, Texas, on August 19, 1921, Roddenberry was a pre-law student in college for three years before becoming interested in aeronautical engineering. In 1941, he trained as a flying cadet in the U.S. Army Air Corps. During World War II (1939-1945), he took part in eighty-nine missions and sorties and was decorated with the Distinguished Flying Cross and the Air Medal. During the war, Roddenberry began to write, selling stories to flight magazines. Back in the United States, he first became a commercial pilot for Pan American World Airways. Later, Roddenberry went to Hollywood intending to write for television. He joined the Los Angeles Police Department to support his family but also to gain life experiences and soon sold scripts to such shows as Goodyear Theatre, Dragnet, and Have Gun Will Travel. Roddenberry's creation, the series Star Trek, was described by him as "Wagon Train to the Stars," referring to the popular western television show Wagon Train.. Rodenberry’s new series, produced by Desilu Studios, debuted in 1966. Although it had low ratings, the series developed a loyal following. However, it was canceled after only three seasons. It rebounded later when many movies and televisions series were spun off from this original concept. In fact, it was the first television series to have an episode preserved in the Smithsonian Institution, where a 3.3-meter (11-foot) model of the U.S.S. Enterprise is also exhibited on the same floor as the Wright brothers' original airplane. The first U.S. space shuttle was named Enterprise in honor of this fictional spacecraft. While making Star Trek, Roddenberry gained a reputation as a futurist, speaking on the subject at universities, the Smithsonian, meetings of the National Aeronautics and Space Administration (NASA), and Library of Congress gatherings. Roddenberry died from heart failure on October 24, 1991, in Santa Monica, California. A year later, a canister of his ashes was taken into space aboard the space shuttle Columbia, during NASA mission STS-52. In 1997, another capsule carrying some of his ashes was launched into space from a Pegasus XL rocket. Roddenberry received a star on Hollywood’s Walk of Fame in 1986.The impact crater Roddenberry on the planet Mars is named after Gene Roddenberry, as is asteroid 4659 Roddenberry, which was discovered in 1981. In 2007, Roddenberry was inducted into the Science Fiction Hall of Fame, held within the Science Fiction Museum in Seattle, Washington. Family: Professional name, Gene Roddenberry; born August 19, 1921, in El Paso, TX; died of a heart attack, October 24, 1991, in Los Angeles, CA; son of Eugene Edward (a master sergeant in U.S. Army) and Carolyn Glen (Goleman) Roddenberry; married Eileen Anita Rexroat, June 20, 1942 (divorced July, 1969); married Majel Barrett (an actress), August 6, 1969; children: (first marriage) Darleen Roddenberry, Dawn Alison R. Compton; (second marriage) Eugene Wesley, Jr. Education: Los Angeles City College, A.A., 1941; attended University of California, Los Angeles, University of Miami, and Columbia University. Politics: Democrat. Memberships: Writers Guild of America, West (past member of executive council), Science Fiction Writers of America, World Future Society, Academy of Television Arts and Sciences (former member of board of governors), American Civil Liberties Union, Caucus for Producers, Writers, and Directors, National Space Society (board of directors), Planetary Society, L-5 Society, Academy of Science Fiction, Fantasy, and Horror Films, Los Angeles Police Band Associates (board of directors), Explorers Club (New York, NY), Bel Air Country Club, La Costa Country Club. Writers Guild of America Award for best teleplay of the year, 1958, for "Helen of Abiginian," an episode of Have Gun Will Travel; Golden Reel awards from Film Council of America, 1962, for The Lieutenant, and 1966, for Star Trek; special award from Twenty-fourth World Science Fair Convention, 1966, for Star Trek; Hugo Award for best dramatic presentation from World Science Fiction Convention, 1967, for "The Menagerie," and 1968, for "The City on the Edge of Forever," both episodes of Star Trek; Brotherhood Award from National Association for the Advancement of Colored People (NAACP), 1967; Gold Medal from Photoplay for most popular television show, 1968, for Star Trek; special plaque from Twenty-sixth World Science Fiction Convention, 1968, for Star Trek; Image Award from the NAACP, 1969, for Star Trek; Emmy Award for Children's Entertainment Series from the Academy of Television Arts and Sciences, 1975, for animated series Star Trek; Freedom Through Knowledge Award from National Space Club, 1979, for lifetime achievement; American Freedom Award from the National Space Club, 1980, for lifetime achievement; Star on Hollywood Walk of Fame, 1985; three Emmy Awards and the Peabody Award, all 1987, all for Star Trek: The Next Generation; Jack Benny Memorial Award from the March of Dimes, 1990, for lifetime achievement; commendation from Civil Aeronautics Board for rescue efforts for 1948 Pan Am airlines crash. D.H.L. from Emerson College, 1973; D.Litt. from Union College, 1977; D.Sc. from Clarkson College, 1981. Pan American Airways, pilot, 1945-49; Los Angeles Police Department, Los Angeles, CA, 1949-53, began as police officer, became sergeant; creator, producer, and writer of television programs and motion pictures, 1953--. President of Norway Productions, Inc. Military service: U.S. Army Air Forces, 1941-45; became second lieutenant; received Distinguished Flying Cross and Air Medal. * (With Stephen E. Whitfield) The Making of "Star Trek," Ballantine, 1968. * The Questor Tapes (based on the pilot; also see below), adapted by D. C. Fontana, Ballantine, 1974. * Star Trek: The Motion Picture, Simon & Schuster, 1979. * (With Susan Sackett) The Making of "Star Trek: The Motion Picture," Simon & Schuster, 1980. * (With Sackett) "Star Trek": The First Twenty-five Years, Pocket Books, 1991. Author of over eighty scripts for television programs, including Goodyear-TV Playhouse, The Kaiser Aluminum Hour, Chevron Theatre, Four Star Playhouse, Dragnet, Jane Wyman Presents, Naked City, and Have Gun Will Travel. Contributor of articles to aeronautical magazines. Contributor of poetry to Embers and New York Times. Poems included in anthologies. * The Lieutenant, National Broadcasting Co. (NBC), 1960-61. * Star Trek (series), NBC, 1966-69. * Genesis II (pilot), Columbia Broadcasting System (CBS), 1973. * Planet Earth (pilot), American Broadcasting Co. (ABC), 1974. * The Questor Tapes (pilot), NBC, 1974. * Spectre (pilot), NBC, 1977. * Star Trek: The Next Generation (syndicated series), 1987--. * Pretty Maids All in a Row, Metro-Goldwyn-Mayer (MGM), 1970. * Star Trek: The Motion Picture, Paramount, 1979. * Star Trek II: The Wrath of Khan, Paramount, 1982. * Star Trek III: The Search for Spock, Paramount, 1984. * Star Trek IV: The Voyage Home, Paramount, 1986. * Star Trek V: The Final Frontier, Paramount, 1989. * Star Trek VI: The Undiscovered Country, Paramount, 1991. The original seventy-nine episodes of the Star Trek television series have been presented on videocassette by Paramount Home Video, and numerous episodes made available on RCA VideoDiscs. NBC-TV broadcasted an original animated series based on the Star Trek television series from September 8, 1973 to August 30, 1975. The first five Star Trek motion pictures have been made available on videocassette by Paramount Home Video. 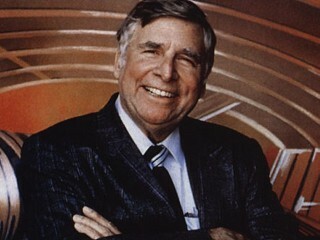 View the full website biography of Gene Roddenberry.